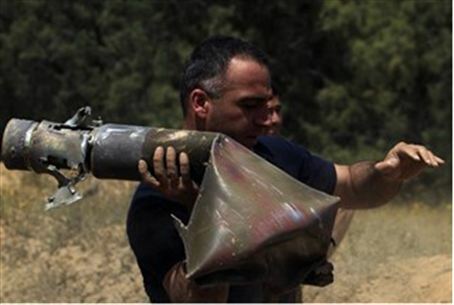 Two Kassam rockets fired by Gaza-based terrorists explode in open areas in the Eshkol Regional Council. Two Kassam rockets fired by Gaza-based terrorists exploded in open areas in the Eshkol Regional Council on Friday afternoon. The rockets did not cause any physical injuries or damage. The rockets were fired despite an Egyptian-brokered “ceasefire” that was supposed to have gone effect in late October, after Gaza-based terrorists fired more than 80 rockets at southern Israel within a period of 24 hours. Similar “ceasefires” have been announced by Hamas rulers after previous rounds of escalation, but the Gaza-based terrorist groups always take advantage of these “ceasefires” to periodically send a reminder to Israelis that they have the ability to fire rockets. In another incident on Thursday evening, a smuggling tunnel exploded in southern Gaza as a group of IDF soldiers were in the middle of an operation to uncover it. One of the soldiers was very lightly wounded in the incident and damage was caused to an empty military vehicle that was standing nearby. Residents of the Eshkol Regional Council on Thursday held a rally at the Sharona Park in Tel Aviv, across from the IDF's Kirya central military base.